After reading a review in Tucson Citizen that called 'Pancho' an 'Animal House' with heart, I was determined to make it to The Screening Room. 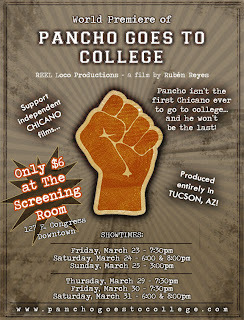 Pancho Goes to College not only sounded like a good time, but my colleague, Bardo Padilla, plays Kiko. 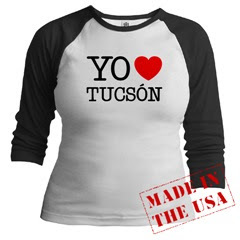 It definitely did turn out to be a good time, especially for a person like me, familiar with Tucson, certain Chicano issues, and the college experience. However, some of the acting, writing and editing could have been vastly improved. If you watch it with an open mind, it can be pretty fun. Also worth noting, despite the film's lack of production, it does a few things that are especially important: a) it shows difference not just between a Hispanic minority and a white majority, but more importantly among young Mexican Americans, Mexicans, and self-identified Chicanos; b) one of the main characters is a disabled person, but the film isn't about his disability. That was interesting to me because it was unlike Hollywood, where any character who belongs to a physical minority can only star in the movie if it is about their disability. Gracias por mandarme el link para el blog. Very interesting stuff!!!! Yo tampoco supe de la pileta para las tortugas hasta hace poco, que pena!